Posted on 5/19/2015, 7:26 am, by rackycoo, under General Projects. It’s almost summer! Are you going anywhere fun this year? I am: even as we speak, I am on a 2,000 mile road trip with my mom and my mother-in-law. We planned this last fall, and the idea was just crazy enough for us to follow through on it. Whee! We’re having some fun! 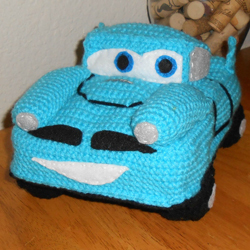 Of course, our car is just a plain SUV, it doesn’t have half the personality of this adorable amigurumi car by hookinmouthcrochet. If this were our car, we definitely wouldn’t have problems finding it in a parking lot! Road trips mean special snacks, like Peanut M&M’s. Mmmm! We will need something to hold all our trash. A trash collector, like this one by TheMistressT, would be perfect! Pack your bags! 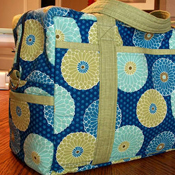 I would absolutely love to be carrying a bright and happy duffel bag. 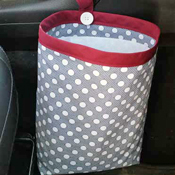 LDesjardin made this one, plus a matching toiletries bag. 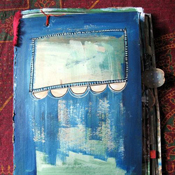 What better way to commemorate the trip than with a travel journal? 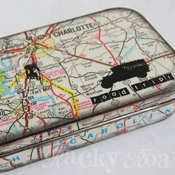 I love this one by Phizzychick; it’s made with recycled envelopes and papers, and is ready to be filled with ticket stubs, photographs, and memories. Don’t forget to take pics of all the crazy roadside attractions, like the World’s Largest Ball of Twine and that giant concrete gnome.